1. Preseason meeting Thursday Jan 28th after school @ 3:45 in the Wisconsin Neighborhood Center. 3. Use your mirror neurons...Read about track and field, watch your events on YouTube.....study your sport. 4. 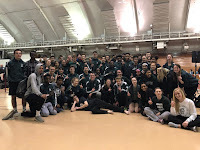 Talk to your teammates about the upcoming season, grab a few other athletes that are not out that can improve their lives through Track & Field. If you would like to review last years end of season Stats & Congrats magazine so that you can set you individual goals click this link, 2009 Season Stats Magazine . See you soon, Coach Tangen.